This is one of 3 new Bundt tins released from NordicWare done in a gold finish, to celebrate their 70th Anniversary. I think this tin will Top many a Bundt Addicts Wish List. The recipe used is from Delicious Magazine This is a fantastic recipe. I’d recommend this to anyone looking for a great Lemon Drizzle cake recipe. 02.Sift the flour, baking powder, and salt into a large bowl. 03. Beat together the butter, sugar and lemon zest, in your stand mixer until the mixture is very pale and fluffy. Add the eggs one at a time, beating well after each addition, then (using a metal spoon) fold in the flour mixture, taking care not to knock out the air you’ve so carefully beat in. Finally stir in the Poppy seeds. 04.Dollop the mixture into the greased bundt tin and smooth the top, then bake for 35-40 min or until a skewer inserted into the centre comes out clean. Another indication that it’s done, is the cake shrinks away from the edge of the tin. 05.While the cake is baking, make the syrup: heat the sugar and lemon juice in a pan and bubble for 3 min until reduced by half, then transfer to a shallow bowl to cool completely. 06.When the cake is cooked, remove from the oven, poke holes all over the surface and, while the cake is still warm, spoon over the cooled syrup (you may not need to use it all). Leave the syrup to soak into the cake for 15 min, then turn the bundt out of the tin onto a wire rack and leave to cool completely. 07.For the topping, put the icing sugar into a jug and add a tsp cold water. Sir well with a fork until smooth, then add a little more water, drop by drop, until the icing reaches a thick, pourable consistency. Drizzle down the inside ridges of the cake, then add a fine sprinkling of poppy seeds. Leave to set for 15 min. I enjoy this, just as it comes with a cup of tea or served with a little whipped cream. Some of my family like it served with lashings of hot Custard. I have since, done a Red Velvet cake in the same tin. 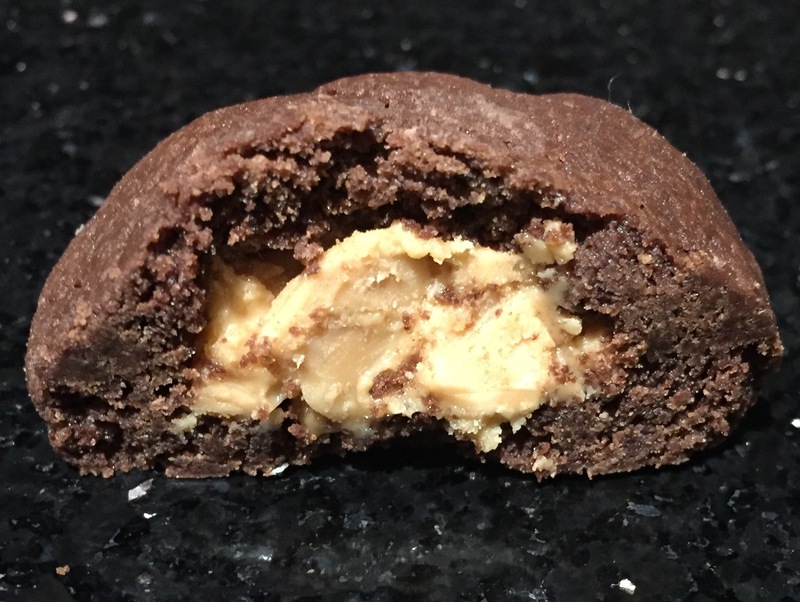 I wanted to see if the detail showed on a dark bake, as well as a light coloured bake. I’m glad to say, both look fabulous. This is a take on the humble Jaffa cake biscuit (or is it a cake) we’ll not argue over that. This and other ‘giant’ variations on cakes, comes about after following ‘The baking nanna’ aka Jackie Heaton on Twitter. The lady in question, persuaded me to try baking using Various silicone moulds. The following recipe is the same recipe that is used for the giant doughnut. The recipe itself is very versatile and can be used for numerous bakes. Jelly – make this first. 2 tins of fizzy orange pop, enough for ¾ pint (optional) I like to make “fizzy jelly” for this and trifles too. Dissolve the jelly crystals in a jug with a little boiling water. Top the jug up with the orange pop or water to ¾ pint. Pour this into your lined tin and place in the fridge to set. Rub plenty of STORK margarine into your mould, and this is all that is required. There is No need to use any flour. Whisk the Eggs and Sugar Together, until well mixed. When you take the mould out of the oven, allow to cool slightly before trying to ease the mould off. Once the cake has cooled fully, the jelly should be set and ready to use. I take a plate a little smaller than the cake and use it as a template to cut around. Leave the jelly on the clingfilm, it makes it easier to transfer it to the cake. I lie the cake on top of the jelly and clingfilm, then turn it over and then remove the clingfilm. Melt both the chocolates in a bowl, over a pan of simmering water. Then stir in the butter. Let the chocolate cool slightly before covering the jelly, otherwise the jelly will melt. I use a pastry brush to apply a thin coat of chocolate on first. After you’ve got a thin coat of chocolate on the jelly, you can add more and more of the chocolate. Use a palette knife to spread the chocolate across the cake. When serving the cake I use a warmed knife to cut through the chocolate (pour boiling water over the blade, then dry with kitchen paper) before cutting the cake. These go down well, especially if made for a children’s party. Most people know of my Love affair with @NordicWareUK tins and my baking of Bundts. Back on the 21/2/16 the Sunday Bake Club theme was #SunShineBakes This gave me the ideal opportunity to bake with my Sunflower Bundt Tin. 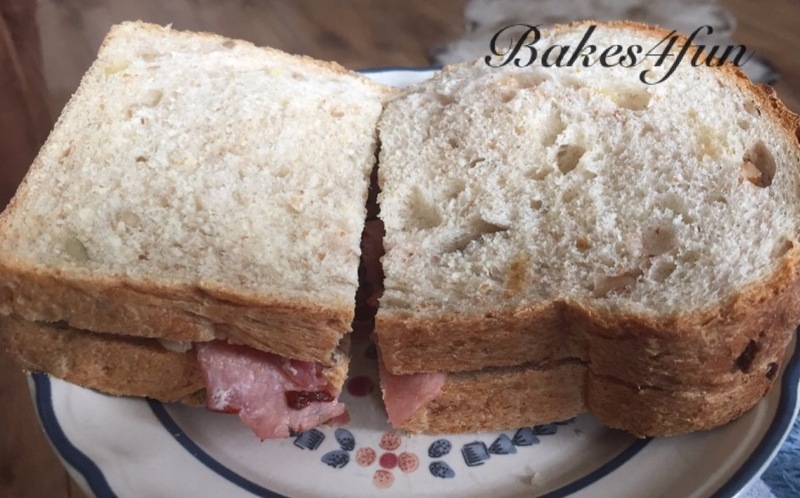 The Sunday Bake Club is a fantastic Baking Community, with over 5000 like minded members, all with one thing in common, a Love of Baking. Every week, the ladies that run the club will dish out a theme, so you to bake along with the members and show your baking prowess to each other. There is always help at hand and tips to be had, if you’re ever looking for advice or help. The recipe I used for this Bundt was from Delicious Magazine I have used this recipe in the past, in several different NordicWare Tins and it always works extremely well. The only variation to the recipe was the addition of Poppy Seeds. 01.Heat the oven to 180°C/fan160°C/gas 4. Generously grease the inside of the Bundt tin with Wilton Cake Release, which I buy from Lakeland. I Use a brush to apply the cake release, making sure I get into all the detailed areas. 03.In another large bowl, using an electric whisk, cream together the butter, sugar and lemon zest until the mixture is very pale and fluffy. Add the eggs one at a time, whisking well after each addition, then (using a metal spoon) fold in the flour mixture, taking care not to knock out the air you’ve so carefully whisked in. 04.Dollop the mixture into the greased bundt tin and smooth the top, then bake for 35-40 min or until a skewer inserted into the centre comes out clean. 06.When the cake is cooked, remove from the oven, poke holes all over the surface and, while the cake is still warm, pour over the cooled syrup. Leave the syrup to soak into the cake for 15 min, then turn the bundt out of the tin onto a wire rack and leave to cool completely. 07.For the topping, I used yellow edible glitter and Chocolate drops for the Sunflower seeds. This is my Variation of the Lemon Drizzle Bundt using NordicWare Sunflower Bundt Tin. This tin is now Discontinued, but the recipe will work equally as well in any 10 cup/2.4 litre Bundt tin. The Bundt was finished with a dusting of Yellow edible glitter. The chocolate drops were stuck to the centre of the cake with a little melted chocolate. Unfortunately this was the only chance I got to take a photo of the inside of the cake, before my family and guests ate it all. My next NordicWare “investment” will be their new 70th Anniversary Crown Bundt This is sure to be the envy of any Bundt Collector / baker. I have tried using Silicone moulds for baking cakes before and not had much success. It’s no secret that silicone and I are not best of friends. That is, until my Twitter friend Jackie Heaton aka The Baking Nanna gave me some hints and tips and persuaded me to give it another go and I’m glad I did. I think these Giant Doughnuts make a great Birthday cake With a difference and an ideal centrepiece on any table. Jackie was even good enough to share her recipe. So I took myself off to Lakeland to Purchase the required silicone Doughnut Mould These are been sold off for £2:49 as they are going to be discontinued, so grab one before they’re all gone, if this type of novelty bake interest you. The box contains 3 parts, top / bottom and lid which can be used To create a dip in the doughnut for a deep filling or Just left off (my preference). Divide the mixture between the Two Doughnut Moulds and stand each half on a baking tray. Once you have cooked both halves and they have cooled, you can then fill and decorate them in whatever way you like, filled with buttercream and topped with brightly coloured icing (as a doughnut often is) Or like the one at the top of the page, filled with Jam an cream and topped with a chocolate Ganache, then covered in sprinkles. Add the cream on top of the jam and put the other half of the doughnut on top of the cream. I reserve a little cream to pipe around the centre of the doughnut to finish it off. Warm the Cream in a saucepan, once warmed remove from the heat and add the chocolate. Whisk the cream and chocolate together, it may look very grainy at first but keep whisking. Once the cream and chocolate are well combined allow to cool for a while, the ganache will thicken slightly, this can then be used to top and drape down the sides of your doughnut. Add your desired topping before your ganache sets. These are also a good way to get children involved in the kitchen. once baked and filled, let your children help decorate them with you. 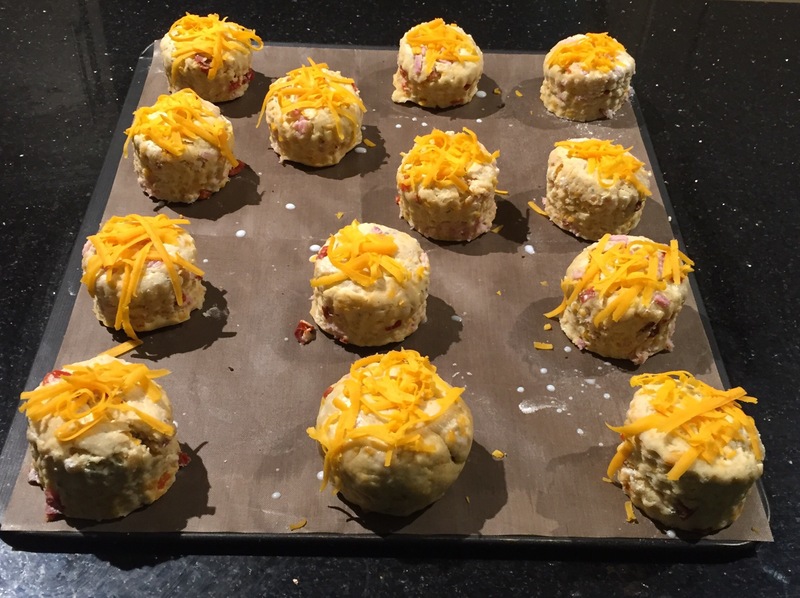 Cheese scones are a good bake to do if you’re a novice baker, or if you’re baking with children. There are minimal ingredients and they’re easy to do, without been time consuming and Boy, do they smell good when they’re cooking. 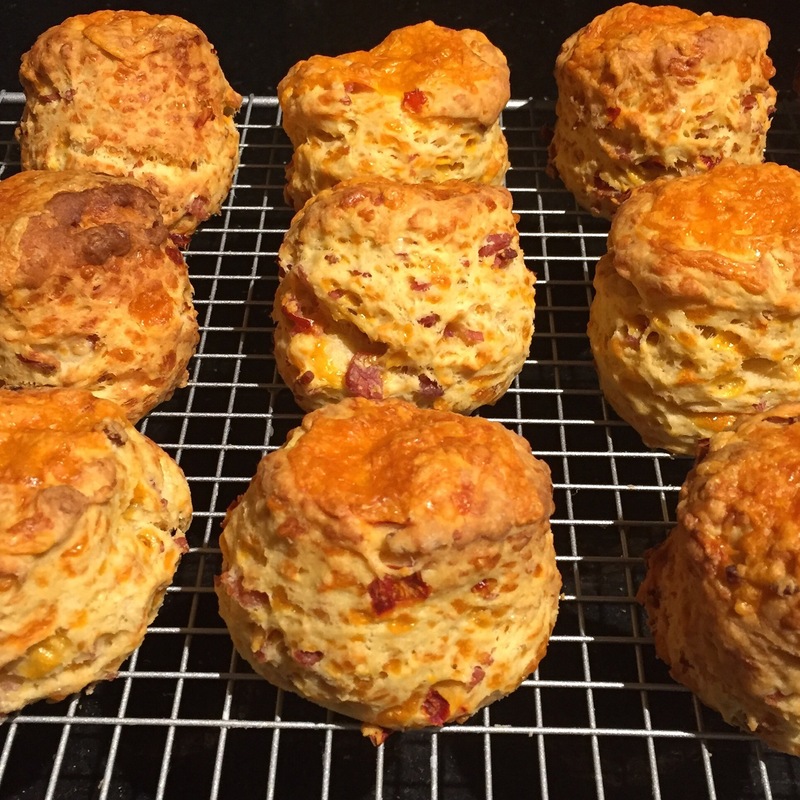 This is a twist on the humble cheese scone. I have made scones for years but recently, I’ve started to add additional flavours to enhance them. These scones have 3 different cheeses in them, Red Leicester for colour, Mature Cheddar and flecks of Danish Blue for a Full flavour. Then just to lift them to the next level, they have diced Smoked Bacon and Jalapeños added. 50g Danish Blue broken into small pieces. Add Cheeses, bacon and jalapeños, then crumble the Danish Blue into the mix. Make a well in the centre of the mix and add half the milk, mix together and keep adding a little milk until all mixture comes together to form a dough. Make sure the dough is the thickness of your scone cutter, (I use a 6cm round X 4cm deep cutter) otherwise you’ll end up with thin biscuits. Dip your scone cutter into flour to prevent the scone sticking and cut out the scones and place onto a lined tray. 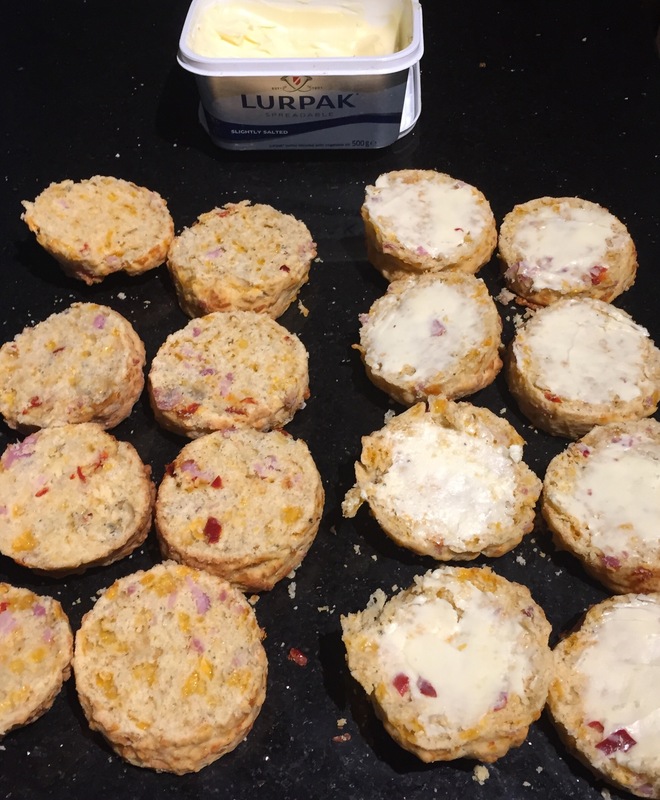 Brush the top of the scones with milk and add a little more grated Red Leicester cheese on top. Cook in the middle of the oven for 18-20 minutes. To test, turn one of the scones over and tap the bottom, they will sound hollow but the scone should be still slightly soft to the touch. They will firm up, once cooled. Over cooking will make them dry. If you can resist eating them while they’re still warm, place onto a cooling rack and leave to cool, then serve with Lashings of Lurpak butter.